hina (the kind you buy and eat on) is a wonderful thing. When entertaining friends, it lends a certain specialness to the evening and shows your guests that you care about their experience in your home. A lot of people I know dismiss the concept of owning or using china as too "bougie" as if it's some ostentatious or shallow display of materialism. My guy friends have conjured up visions of frilly white plates with pale painted bunny rabbits as their immortal definition of what china is. Let me put that all to rest right now. There are hordes of china manufacturers and patterns available, and for sure choosing one of them as your pattern can be daunting. On the other hand, you chose your tie in a sea of ties, you chose your suit, your car, your home. Your china is another expression of your personality. You might even own more than one pattern; you might inherit some from your parents or relatives. I love mine, but there is one particular pattern that is the most stunning I've ever seen in my life. I'm not sure you'd serve food on this, but if you did it would be certain to be a decadent meal no matter what you put on it. The manufacturer is Wedgwood - a company that has been around as long as many of the oldest china companies. The pattern is "Fairyland Lustre", which unfortunately for our budgets was not so long lived. 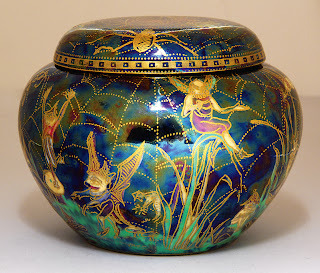 It was designed by Daisy Makeig-Jones and was released between 1915 and 1931 to a grateful consumer base who was looking for something to take their minds off the war. Fanciful, bold, and decorated with birds, insects, fairies, goblins, etc this collection is absolutely breathtaking....as are the prices. 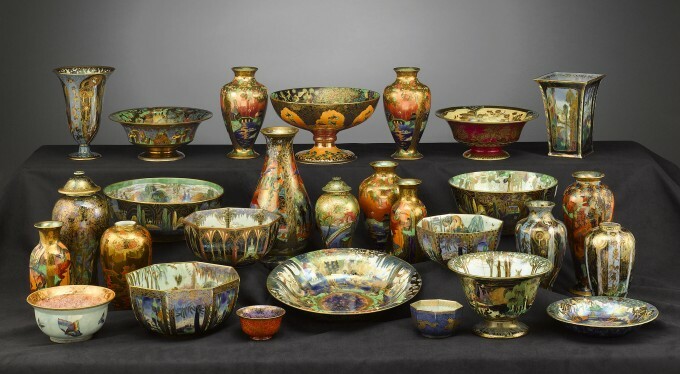 Large bowls sell for around $5000 to 6,000, plates for $1,200 to $3,500, large vases from $5,000 to over $20,000. I'll be lucky to own a few pieces in my lifetime. In researching the topic, I learned a few key things. 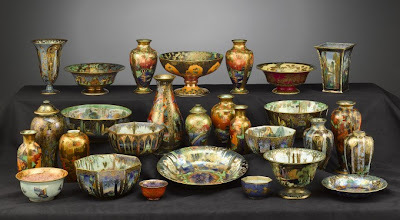 First, collectors seem to significanly devalue pieces that have defects or repairs or damage. They're real picky about those three things, and if the item has one of those - no matter how subtle - the price is very significantly diminished. This makes it so that a few pieces may be attainable for those of us who are not incredibly wealthy. Second, you need to know how to spot fakes and determine if repairs were made. One way of determining this is to tap the item (such as a bowl) with your fingernail. If you don't hear a distinct ring, there's a good chance the item was repaired. Look for bold and sharp colors; if the color is muted or if something looks a little blurry, you might be looking at a fake. Are you now as enamoured with this as I am? It's breathtaking. If you're like some of my friends, I encourage you to rethink your preconceptions about what china is. If you look hard enough, you'll find some wonderful things out there.